Officials say the deadline could be extended at the Ayatollah's whim, days after Khamenei said 'no guarantees' Iran will follow the deal. The June 30, 2015 deadline for a final nuclear agreement between the P5+1 powers and Iran is subject to the whims of the Iranian Supreme Leader, Tehran has announced. “Iran will work hard to reach an agreement within the specified time of three months or even sooner, but if the deal doesn’t meet the criteria the leader has introduced for a good deal, we would extend the time,” Deputy Foreign Minister Abbas Araqchi stated on public television on Friday, according to Mehr news agency. 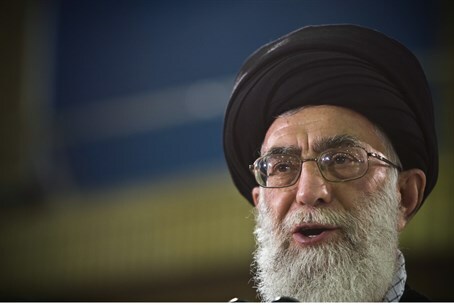 The "leader" in question is Ayatollah Ali Khamenei, the Supreme Leader of the Islamic Republic who is known for his extremism and Islamism - and who is also responsible for the glut of Iran's decision-making. Khamenei made his first-ever public statement about the deal on Thursday, in which he denied Iran will follow the agreement at all. “Everything done so far neither guarantees an agreement in principle nor its contents, nor does it guarantee that the negotiations will continue to the end,” he said. The statements are the latest in a series of discrepancies between what the West has presented to the world media regarding the Iranian nuclear deal and Iran's version of events. Differing accounts of what the deal entails have been published between the US, Europe, and Iran, with each version providing drastic variations on the deal's content. Iranian Revolutionary Guards chief General Mohammed Ali Jafari, who is considered to be one of the most influential men in Tehran, stated publicly Saturday night that the US conceded all of its red lines in negotiating the deal - despite the US's draft of the agreement stating otherwise. Days earlier, US President Barack Obama admitted that as a result of the deal, Iran will be able to reach a "zero" breakout time by 2028, meaning it could produce nuclear weapons immediately whenever it wanted to.